Today is #InternationalWheelchairDay which has me reflecting just how much my life has changed since I decided to start using a wheelchair back in 2014. For some, this might come as a surprise — particularly those of you who have only come to meet me recently — as at the moment I don’t use my wheelchair hardly at all. In fact, the last 12 months have been something I never expected to experience again, a time where I have been more well than unwell. A time when I was able to exercise, even to run, without crippling exhaustion or injuries. I’ve included a bit of background for those who might not know the back-history so feel free to scoot through if you already know! I have been hypermobile all my life, ever since I can remember I had joint pain, clumsiness, sprained joints and injuries but this was all thought to be ‘growing pains’ and just not paying attention to what I was doing! Despite that, I was extremely active throughout my childhood and teens — something I am very thankful for, as it built strong muscles that made up for the weaknesses that I had. It wasn’t until my mid-20’s when studying to be a Physiotherapist that I was diagnosed (by one of our lecturers, a consultant spinal physio) with widespread hypermobility. Hypermobility Syndrome as it was known, or Ehlers-Danlos Syndrome (EDS for short) as it is now classified in the 2017 nosology, is a heritable condition (meaning it’s something that is passed between generations — my paternal grandmother was likely a sufferer as well) which affects connective tissue — specifically collagen. The downside is that a lot of important things in our bodies rely on connective tissue to function. Tendons and ligaments which join muscle to bone, and hold joints together. Our internal organs. Skin. I literally knew nothing about Hypermobility before I was diagnosed, but I ended up doing my Masters thesis on it because as soon as I started learning from resources at the HMSA and scientific papers, lots of pieces of a fragmented jigsaw puzzle started to come together. Just under nine years ago, a whole series of events came together which I believe led to a significant — and very rapid — decline in my health. I pushed myself physically to my absolute limits doing a 200 mile walk across the UK in atrocious weather; I was under immense pressure at work in less than ideal circumstances; and I was emotionally distraught at being unable to secure my junior rotation as a Physiotherapist, and facing the likelihood of that career never materialising after two years of hard work and with a large loan to pay off. It started as pain in my thumb which was diagnosed as excess hypermobility and braced in a splint. This (unhelpfully, in hindsight!) allowed me to continue to work as a data analyst but led to elbow and shoulder pain, followed by spinal pain. As was my default, I just kept on ploughing through, working full time while building websites in my spare time and playing my beloved hockey two or three times a week, supporting a Duke of Edinburgh’s Gold Award group with their expeditions, and assessing for various organisations. Unsurprisingly, the relentless pressure I piled on myself led to something of a meltdown. I started to experience crippling exhaustion which made it almost impossible to function, hand-in-hand with an epic decline in my mental health. Why couldn’t I fix this? Why can’t I just get off my arse and get myself to work? Don’t be so weak and feeble! Owch. It’s painful to even write those thoughts down, let alone own the fact that they were so viciously directed toward myself for many, many years. It was my partner who, in the end, gently suggested I needed to go and see the doctor. I could tell he was really concerned — the way I was behaving was so unlike ‘me’, and he was really worried. The doctor signed me off for what would become over a month, and told me very directly that if I wanted to stand any chance of reversing the situation I needed to stop. How do you even do that, I asked myself? Both my parents were one generation away from abject poverty, and as a result, the work ethic instilled in me was such a strong driver in my life that I simply didn’t know how to do anything other than push. 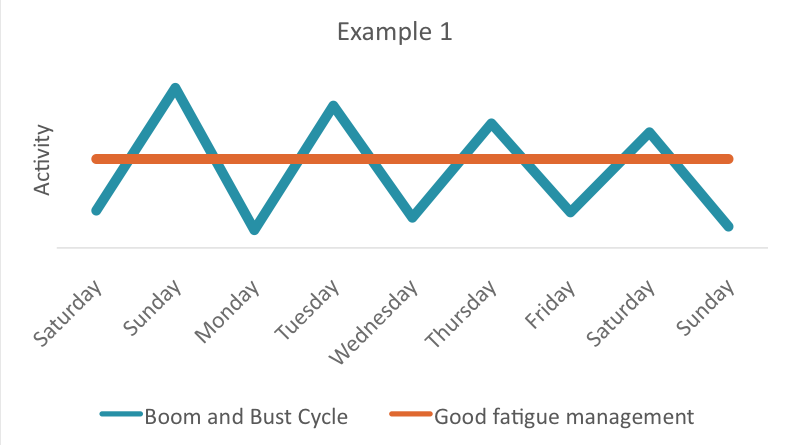 Anybody who has lived with a chronic condition will be familiar with the endless cycle of boom and bust. You start to feel better having rested/got over the worst part .. hurrah! The pain is under control through meds/rest, so you can do stuff. Quick, let’s do all the stuff we haven’t been able to do before! Over the intervening 5 years or so, I tried so many times to break out of these cycles. I’d been through physiotherapy multiple times, discharged by consultants because they felt there was nothing else they could do for me. It’s an ancient teaching called Pratītyasamutpāda, if you want to look it up. What this taught me, in a profound way, is that everything is governed by conditions. I realised that I could change the way I approached my life. I could make changes — big and small — to the conditions of my life, which affected the way I lived my life. Those conditions were both external, but also — and perhaps most significantly — internal. The way I talked to myself about myself, and the way I approached life’s challenges. This was the biggest shift I think I have ever experienced in my life, from being a passive bystander in my life; in which everything was being ‘done unto me’ and I was powerless to do anything about it, to being the steering force in my life; taking proactive steps to live my best life, despite the challenges it threw up at me. The biggest cause of fatigue and exhaustion in my life was related to the physicality of what I did. I was building a business, working long hours, speaking at conferences and events which were often several days in duration and all over the world. I’d manage for a few weeks, maybe even a month at a time, before imploding and crashing into fatigue, pain and exhaustion. 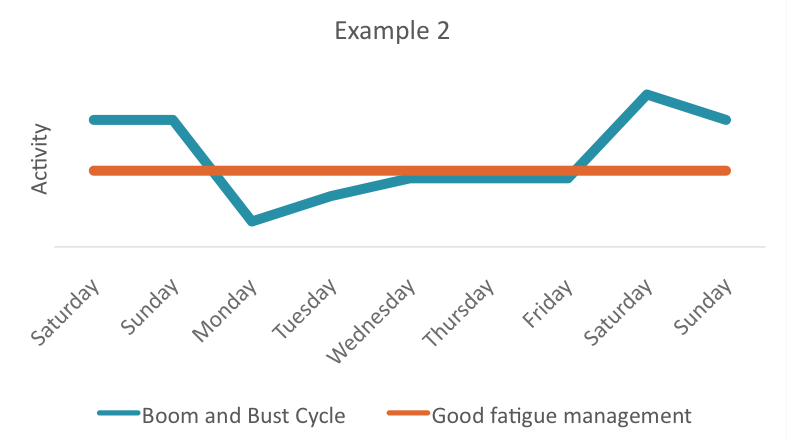 Both my physio and my doctor told me that I needed to either change what I was doing and cut back on my work, or do it differently so that it didn’t result in so much pain and exhaustion which was undoing all the hard work I had done in therapy/pain management almost overnight. In 2014, after about a year of coming to terms with the idea, I had pretty much decided that enough was enough. I needed to find a way to enable my body to rest, to put less demand on it while still being able to do most of what I loved doing. I can remember breaking down in tears in my study group for the first time ever, when I shared this with my closest friends. I shared that it felt like I had given in to not being good enough, that it was the start of a downward spiral. I couldn’t quite bring myself to see it as a positive move yet. What was obvious was that I needed to be clear to everybody around me that I was not superwoman. Most people at this stage had no idea of how much I was suffering in silence — both physically and mentally. I had tried using a wheelchair when I’d been struggling — at the Boston Science Museum after half an hour my feet were on fire and my back was killing me, so I asked to borrow a self-propelling wheelchair and spent the rest of the day wheeling about the place and realising that while it was physically hard work (hire chairs tend to be extremely heavy!) I was actually able to do stuff, rather than having to go home in pain and spend the rest of the day in bed! It was a chance discovery on a trip to London with my partner, where the Science Museum had some incredibly futuristic-looking Trekinetic K2 wheelchairs, that I discovered my wheelchair-to-be. In past visits I had been cranky, in pain and exhausted within an hour (and I LOVE science museums and would spend an entire day there if I could) … but this time, I spent the entire day whizzing around the whole building, poking buttons and spinning dials and generally having an awesome time. I didn’t crash at the end of it, in fact we went on to have a lovely meal together. We both saw, so clearly, this was what I needed in my future, to really start to live my life. I shared my experiences on Google+ (which was my platform of choice at the time!) and started the process to figure out how I could get one of these amazing chairs. 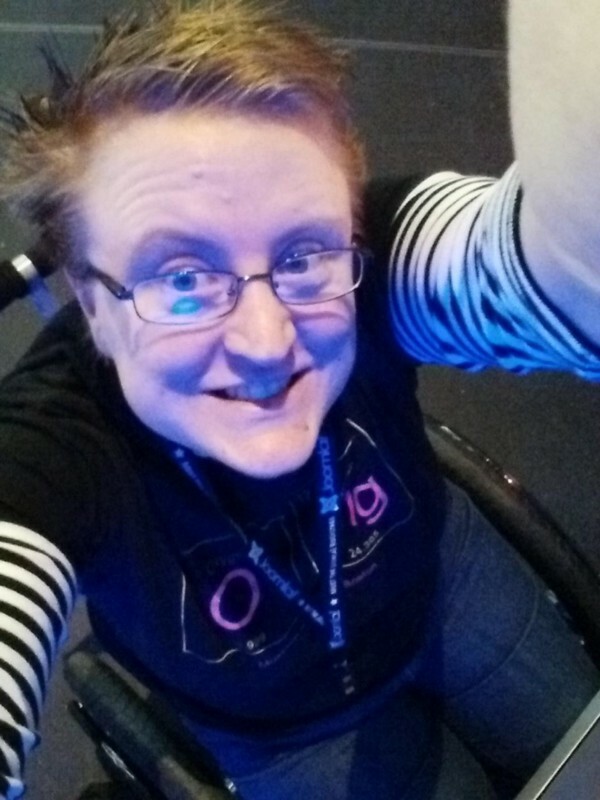 Having had such an overwhelmingly positive experience at the Science Museum, I knew that I needed to set up the conditions so that the first few times I used a wheelchair ‘out in the world’ on my own, they would be positive experiences which would help me to make the transition to accepting this as part of my life more easily. So many people see a wheelchair negatively. Oh, poor you, you’re in a wheelchair. Oh my gosh, what happened?! It’s super hard to have to go through your medical history or address difficult topics — sometimes with complete strangers — multiple times a day! Stickman Communications cards were super helpful with this — especially in foreign countries! For me, my chair was giving me my life back. It was a positive step, giving me back the ability to do all the stuff I wanted to do and not have all the negative side effects. To break the vicious cycles that were controlling my life. On my worst days it meant I could still work, still function, still be a productive member of society, without worsening my conditions. On my best days, it helped me to really start to care for myself. 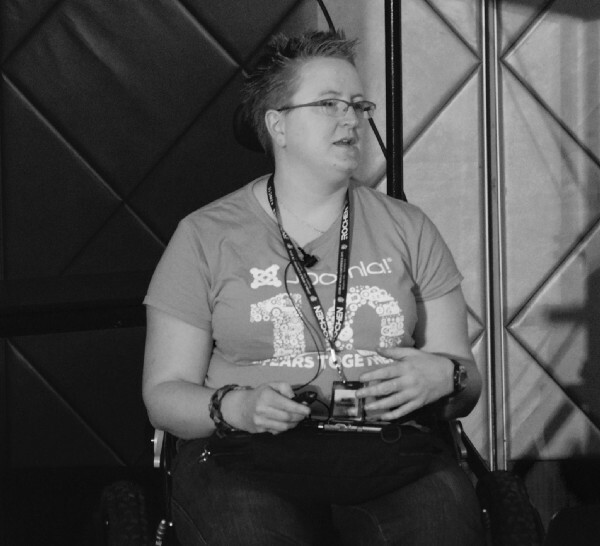 To learn that I needed to take my own health seriously, and that my wheelchair was a huge step in a positive direction. 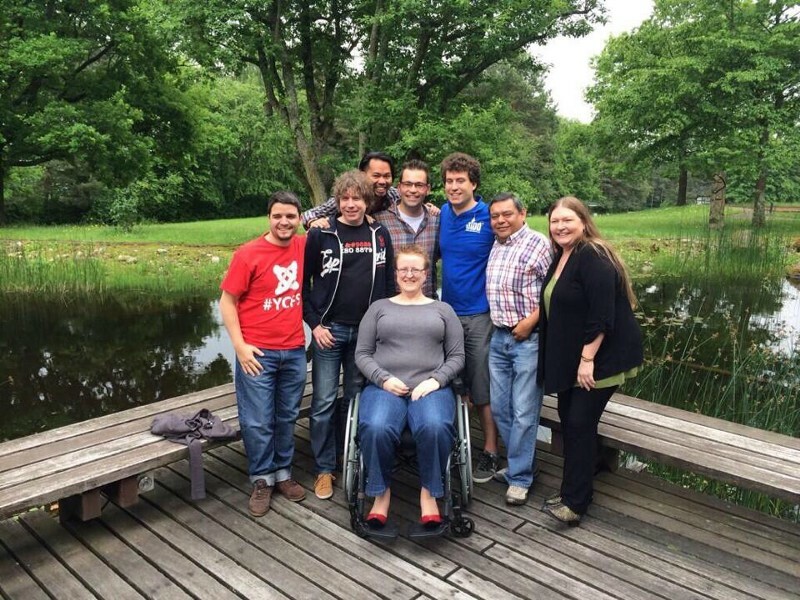 The first conference I attended with my wheelchair in Europe had a leadership team summit attached to it before the conference, so I nervously wrote an email to the whole team, telling them that I would be using a wheelchair, explaining the back-story, and asking for their support. I explained that I was still learning, still figuring stuff out, and importantly still learning to accept help from others. I asked them to feel free to offer me help, but be willing for me to reject the offer if I wanted to try to do something myself. I couldn’t have had a more positive experience at that first outing as I think this picture sums up! My friends were simply fantastic. We had so much fun, I learned so much, and importantly I gained so much confidence. 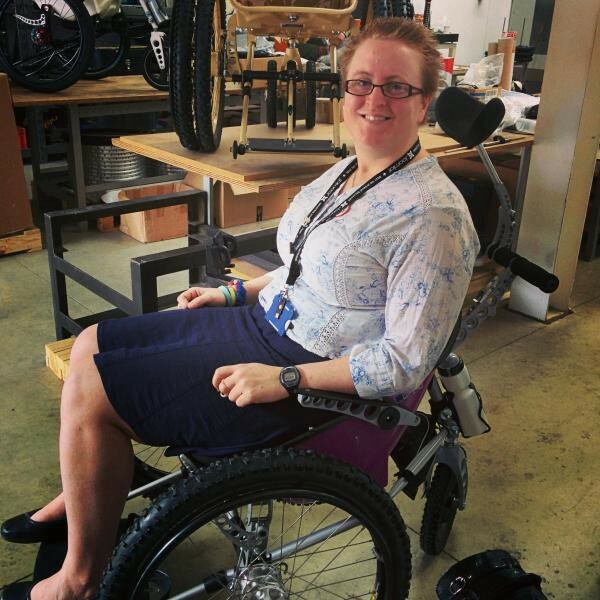 When my Trekinetic chair was ordered and on the way, I knew it was time to ‘come out’ to the wider world — especially as I was about to be manning a stand at a large exhibition and seeing many of my business networking friends who largely had no idea about my health. 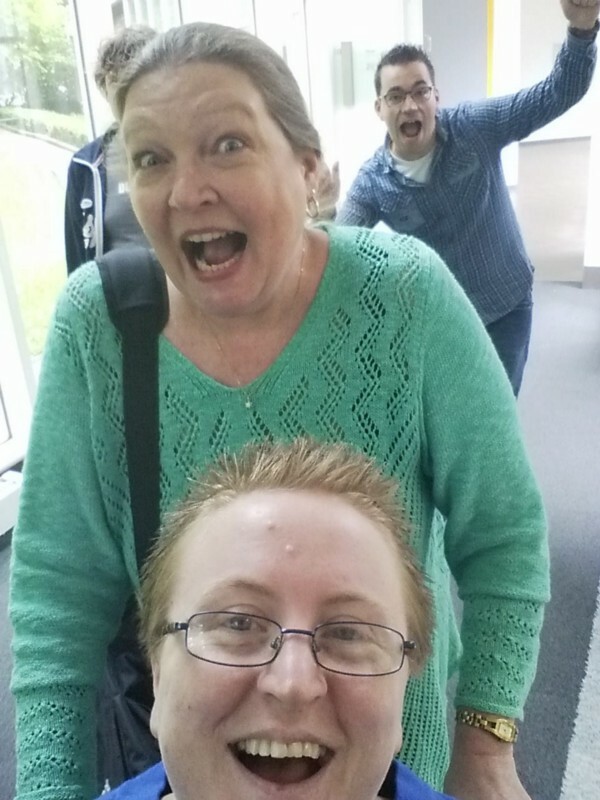 I shared through a blog post on my website and across my social media channels, an open and vulnerable post about what was going on for me and why I was going to be using a wheelchair more often. You can read the post here: Life is better with wheels. Life really did get better with wheels! My wheelchair took me all over the world, from India to Cancun, Germany to the USA. It gave me the freedom to do what I wanted to do, without the fear of constant pain and exhaustion. 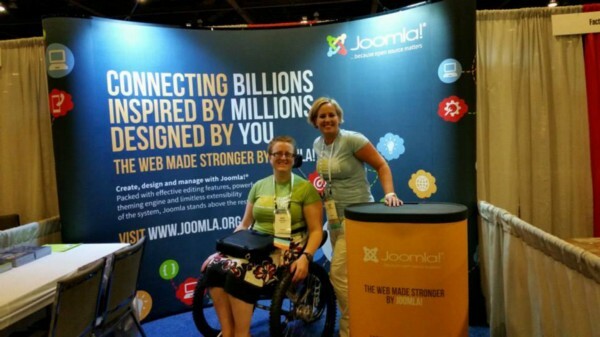 I spoke at conferences from my chair, presented to board meetings, visited clients, represented Joomla! at events, and generally got on with my life. I got used to the questions — both kind and the not-so-kind — and learned all the tricks of the trade that nobody ever tells you about using a wheelchair! The great thing about the Trekinetic is that, unlike other wheelchairs, the action to self-propel does not put your shoulders in a compromised position — it’s more like doing a bench press movement. So, I got pretty strong arms .. especially going up the hills to the blue badge parking in Brighton! I had some shocking experiences, like BA breaking my chair at Gatwick and not telling me while pushing me through the terminal with a wheel almost hanging off the axle! I also had some fantastic experiences, like the team at Brighton Dome being nothing short of awesome. I also had a lot of positive experiences within my work — along with the opportunity to raise awareness of just how poor the accessibility was in some venues across East Anglia! 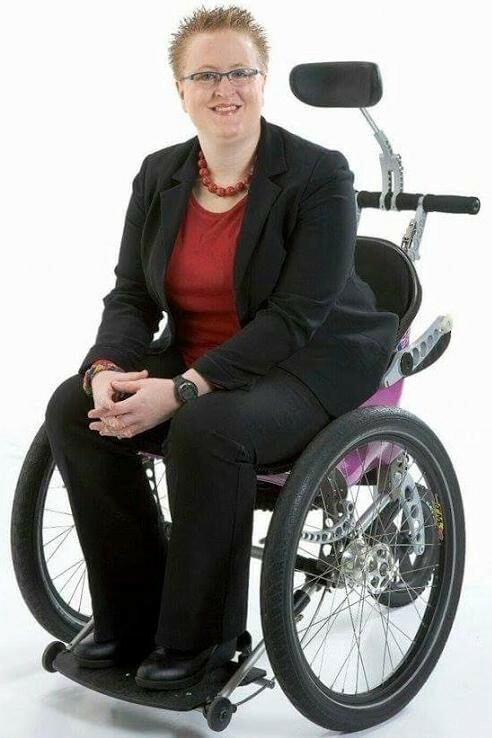 Honestly, any business owner should spend a day using a wheelchair to really get an idea for the difficulties that wheelies can face, it would be an eye-opening experience, I’m sure! Reducing the amount of physical crashes I experienced and injuries I picked up meant that I had increasing amounts of energy. Energy I could direct in positive directions, to help me to grow and improve my life further. A close friend — Frank Delventhal — who practices strength training approached me and offered that, when I felt ready, he would be more than willing to help me learn some strength exercises to help my body cope with using my chair and to improve my body strength. It took nearly a year before I was in a place to take him up on it, but that’s another point where I started to take positive steps to improving my health. We started with super simple exercises — mostly bodyweight training — with me sending a video to show my technique and him giving me feedback in a video. Later, I found a local trainer who worked with people who had disabilities and had experience with training clients who had EDS. Samantha Muncaster from Dilly’s PT was simply amazing. The torture chamber. Otherwise known as a random room at Adastral Park where we trained twice a week! 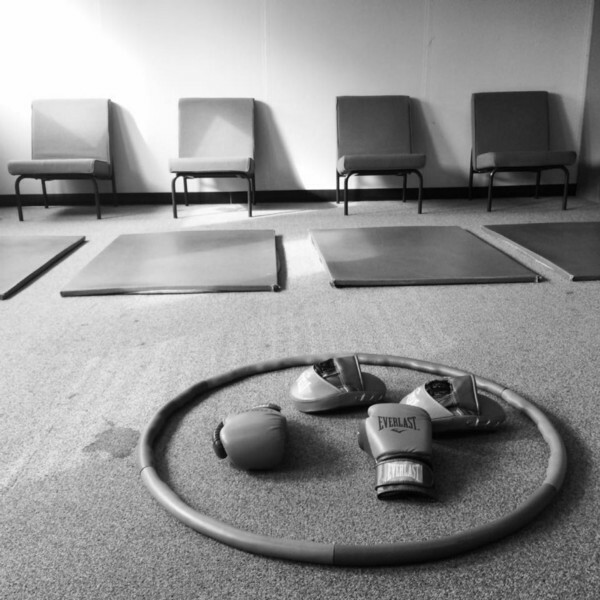 Everything from basic bodyweight training to boxing. Sam met me where I was at, pushed me within my limits, respected my boundaries when things weren’t doing so good, and most importantly, had unwavering confidence in my capability to get stronger both physically and mentally through consistent exercise. It’s hard to believe that when we started, I was only really able to walk short distances, do sit-to-stands from a chair and I could only do lunges with something to hold on to! After nearly a year, we graduated to mini-circuits, and what I now know to be ‘jeffing’ — walking, with intervals of jogging. For the next three years, although I was training at varying intensities twice a week and starting to get much stronger, even being able to jog for around 10 minutes, I was still cycling between boom and bust — at times wiping me out for several days at a time. I hadn’t fully cracked the game that is known as ‘pacing’. I would still push myself flat out, work crazy long hours, train really hard on those two days, and then wonder why after a couple of weeks my body would fail me. Pacing effectively takes a LOT of patience, and a LOT of courage. Patience with yourself, with the fact that you are still learning the ropes. Courage to accept when you’ve screwed it up. To get back on the wagon — often starting way further back than when you fell off — and to keep a positive mindset, to learn from the experience. For me, consistency has been absolutely key. Whatever is happening with my body, still committing to do something — even if that is just half an hour of stretching — that has a positive impact on my body. Getting rid of the negative habits that kept me in the downward spirals, one choice at a time. Consistency isn’t only necessary from the physical training aspect though. It has been really important for me to consistently come back to my mental states, the way that I talk to myself about myself, compare myself to others, to how life used to be ‘before the crash’. To really reflect on them, and share with others what’s going on — and to share the celebrations, the moments when things have changed, when positivity reigns. If your closest friend was suffering, in this moment — as you are — would you speak to them in the way that you speak to yourself in your own mind? Without a doubt, I would not be where I am now — being able to train most days, running regularly and even joining races, and being physically and mentally well — without my wheelchair. While I currently don’t need to use my wheelchair much at the moment, it doesn’t by any means suggest that I won’t need to use it again in the future if things change and my health deteriorates. This time, however, I would have absolutely no hesitation whatsoever at using a wheelchair if I needed to. It empowered me in ways I didn’t know possible, gave me strength and courage at times where both were at an all time low, and enabled me to heal, to recover, and to come back stronger than ever. To those who are new to wheels or at the point where wheels might be coming into your life, I say that you can choose how to to face this challenge. My experience has been that facing it proactively, with a positive mindset, is a much better experience than treating it as something negative that is holding you back. Follow inspiring wheelies and connect with them on social media. Learn from them. See the world through their eyes and explore in yourself what you can change to live your best life. Whether you are going to be using a wheelchair for the long-term or not, the way you deal with it and approach your life with wheels can have such a strong impact. Choose positivity, courage and compassion. Choose that for yourself.